"There are more police on the street tonight than whores." 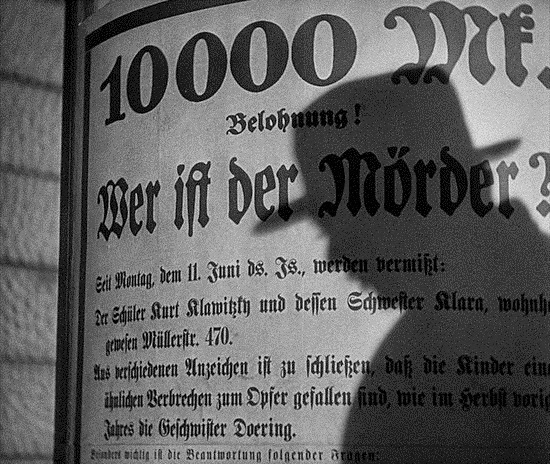 Fritz Lang's M is about a child murderer, Hans Beckert (Peter Lorre), and by the end of the film he's the least evil part of it. 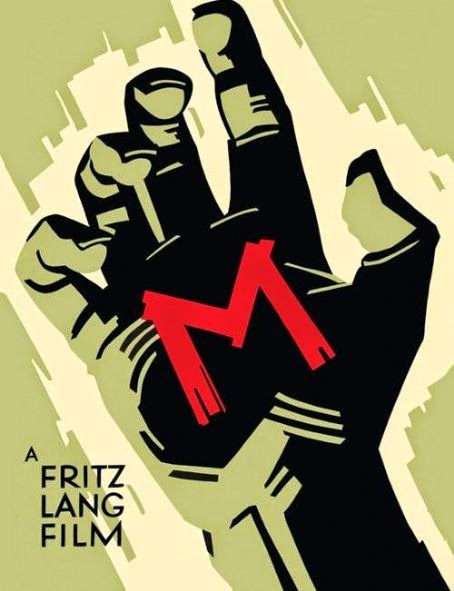 Instead of a simple suspense thriller, Lang gives us a complex critique of society and its reaction to what it doesn't understand. Daring would be a massive understatement. Beginnings are important. The opening moments of M involve a group of children singing a song about a "man in black" who'll make you into "mincemeat" with his "cleaver's blade," and the film thereby foregrounds its focus on loss of innocence. It might sound obvious that a movie involving a child murderer is about loss of innocence, but the important thing to note here is that he hasn't even entered the story yet. These children learned their grotesque song independently. They even insist on singing it: after being told to stop, they merely wait for a minute and then start over. This might sound small, but it begins the film's examination of humanity with a depiction of it in its supposedly incorruptible state already defiled by violence. From here the killer makes his literally shadowy entrance, and the town immediately goes to pieces. Panic. Paranoia. It's understandable, but what's interesting about the way it's presented is that there's no central protagonist to guide us through the chaos, no light to shine out through the darkness. No superheroes. Men and women accuse each other on nonexistent evidence—even parents aren't safe from the community's judgment. Everything goes so topsy-turvy that the only trustworthy folks are the professional criminals. There's a wonderful scene where the masters of each criminal vocation convene, and this meeting of the den of thieves is interwoven with a larger meeting of local government officials. Not only are the two gatherings compared visually, there are men present at both. The distinction between law and crime is slipping away as the city is consumed by its fear and distrust. While the film presents society in a negative light, it conversely presents the murderer in a sympathetic one. We never see his crimes, and instead we see his persecution. He's scared and frightened of exactly the people the film has been showing us are scary and frightening. We see the film through his eyes, so that when the police chase after him we root for him to escape. One shot in particular perfectly embodies his presentation: the camera looks at him through the partial cover of a bush as he cowers in fear. The branches breaking up his face visually externalize the conflicted nature of his internal reality. He fears his pursuers, yes; but he also fears himself. This all comes together in the final act at his trial. The scene is clearly split into two sides: Hans on one side defending himself with his reluctant lawyer, and the mob on the other side attacking him. It is important to note that the trial is not a traditional legal one, but instead takes place underground and is presided over by other thieves and murderers. This is Lang's picture of social justice. At one point the defending attorney even points out that the lead prosecutor has multiple counts of murder on his record, to which he does not plead innocent. The trial is hypocritical down to its foundation. On top of this, the mob is consistently portrayed as bloodthirsty and unsympathetic to Hans, whereas Hans is always shown as diminutive and remorseful. Here he delivers the central speech* of the film where he explains how haunted he is by what he's done and bemoans his inability to escape from himself. M is a tragedy, the people are the villain, and Hans Beckert, the child murderer, is the victim. In technical terms, the film is nothing short of gorgeous. The obvious highlight is the lighting, but Lang also does a marvelous job with camera movements (pans in particular) and exaggerated angles (high & low). 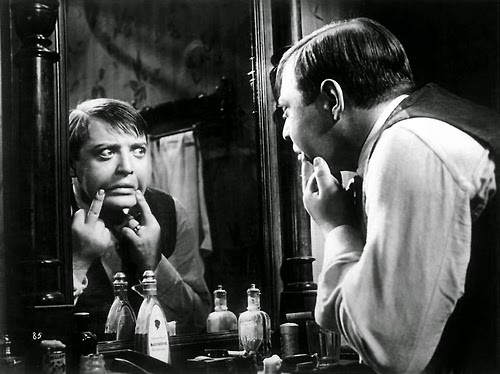 Peter Lorre is also great—I've always loved him in The Maltese Falcon, but he's even better here. There are some lovely montages reminiscent of his work on Metropolis, and the parallel editing between the two meetings mentioned above shows vision rarely if ever duplicated since. The movie never feels its more than 80 years of age, and aside from the black and white and the 4:3 aspect ratio it seems as fresh as if it were released today. Occasionally I felt like Lang was still adjusting to the sound era and that some of the sequences (the montages in particular) would have worked better without a voiceover (I had a similar problem with The Testament of Dr. Mabuse). Beyond that, however, M is one of the first true masterpieces of sound cinema. *"It's there all the time, driving me out to wander the streets, following me, silently, but I can feel it there. It's me, pursuing myself! I want to escape, to escape from myself! But it's impossible. I can't escape, I have to obey it. 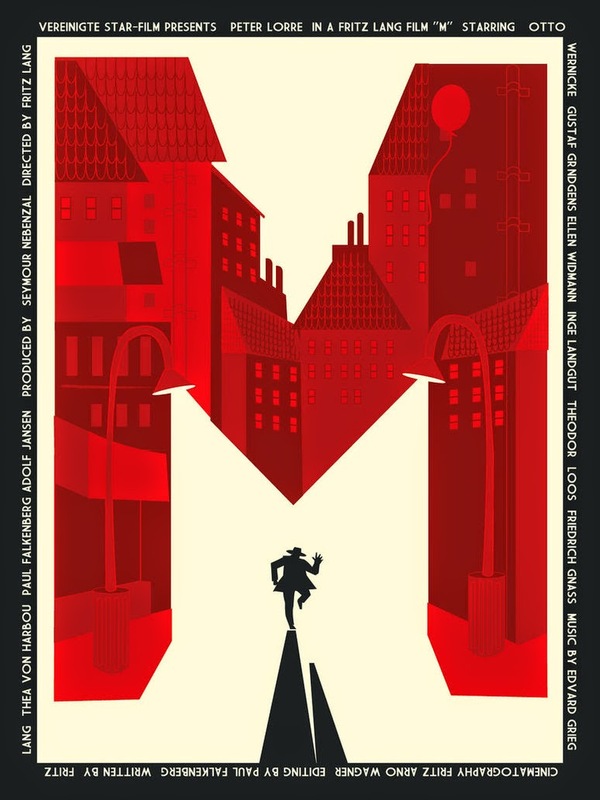 I have to run, run... endless streets. I want to escape, to get away! And I'm pursued by ghosts. Ghosts of mothers and of those children... they never leave me. They are always there... always, always, always! Except when I do it, when I... Then I can't remember anything. And afterwards I see those posters and read what I've done, and read, and read... did I do that? But I can't remember anything about it! But who will believe me? Who knows what it's like to be me? How I'm forced to act... how I must, must... don't want to, must! Don't want to, but must! And then a voice screams! I can't bear to hear it! I can't go on! I can't... I can't..."